A $250,000 grant was presented to Avenue CDC during Looscan Elementary’s winter program. The area surrounding HISD’s Looscan Elementary School will soon be transformed thanks to a $250,000 grant from Republic Services for an upcoming neighborhood revitalization project. 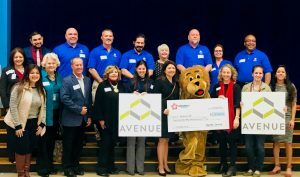 The grant funds, awarded to Houston-area nonprofit Avenue CDC, will be used for the organization’s Boosting Success for Looscan Elementary School project. The funds will be allocated to improve safe routes to school, SPARK Park renovations, and lead abatement in 10 neighborhood homes. The grant will be presented Wednesday during the school’s winter program. Avenue CDC is a builder of homes and a builder of communities in Houston, Texas. The organization builds affordable homes, provides education, and supports robust community engagement programs that promote resident leadership and improved quality of life for all Houstonians. This entry was posted in Achievement/Recognition, News on December 17, 2018 by HISD Communications.